This Upgrade Tactical Knob and Bolt Handle Kit for Savage Arms Centerfire Rifles (Models 10/110, 11/111, 12/112, 16/116 and Stevens 200) is super-strong and ultra-light. The bolt handle is a fully CNC machined 1-piece Grade 5 Titanium Alloy for Savage Centerfire models. 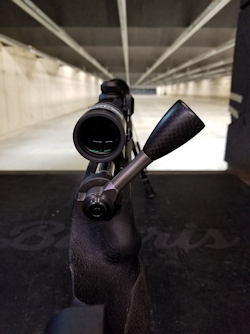 No other rifle benefits more in weight savings by replacing the original factory handle. The oversized cast steel factory handles from Savage are excessively heavy. Lumley Arms Titanium version with oversized 7075-T76 Aircraft Aluminum knob weighs 2.1oz (60g), which is over 50% lighter than the factory handles at 4.2oz (120g)! - without making any compromises on strength, finish or quality. Lumley Arms start with the best quality grade 5 Titanium Alloy (Ti6Al4V) and CNC machines the unit to tight tolerances to fit the factory Savage bolt. There are no castings, forgings or rough finishes. Lumley Arms glass bead blasts the units, visually inspects them and then test fits each to a factory bolt before packing. You will not get a stronger, lighter and tougher bolt handle kit anywhere! 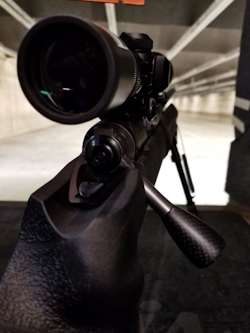 Whether you are building the ultimate hunting rifle, need to shave a precious few grams of the competition rifle, or like us, simply want to use the best gear available, these are the ultimate Savage replacement. This handle is not designed to fit the Savage axis. The Savage bolt handle are secured to the rear of the bolt body by a large hex-head screw (in most cases). The handle can be removed from the bolt body by using a 1/4" Allen Key and turning this screw counter-clockwise. Once the original handle has been removed, the bolt handle kit will slot into place, with the handle either facing left (for LH bolt handles) or facing right (for RH bolt handles). If your bolt body dimensions are larger than usual, some trimming of the collar with a small needle file or stone will be required (detailed below). Apply a small amount of quality bolt grease to any surface modified before reassembly. Please don't over tighten the large bolt screw when reassembling and avoid cross-threading. Note: Minor filing of steel collar may be required to fit to factory bolt body! The upgrade bolt handle kit is machined to TIGHT tolerances for the perfect 'no-wiggle' fit. In most cases the upgrade bolt handle kit will firmly press on (or tap on with a nylon-tipped hammer) to your factory-original bolt body. Just to be sure, Lumley Arms test every unit on two factory bolt bodies before packing. In some cases; however, minor adjustment of the steel collar with a file or stone will be needed where the collar contacts the top and bottom of both tabs at the end of the bolt body. This is due to wider variations in factory tolerances between individual Savage rifles. Some after market aftermarket bolt bodies are manufactured with larger-than-original dimensions on these two tabs which will require modification. Weight: 30 grams or 1.0 OZ! Weight: 30 grams or 1 OZ! Complete Kit weighs 60 grams (2.1oz)!